Every pet needs supplies that is food as well certain good equipment required to keep them healthy. The things which we give to our pets should be good enough and healthy ones only. So here are some of the products for your pets. It’s a front range harness made by Ruffwear. This company produces quality products for dogs for out door adventures.This harness comes with 2 leashes attachment points, an aluminium V ring centered on dogs back for everyday walks. Reinforced webbing at dog ‘s chest gives an added advantage for training as well as adding control. ID pockets keeps dog tags quiet and easily accessible. This product mainly aims for enhancing dog ability and providing a good quality product and to give an advantage for outdoor adventures. Small and portable grooming table surface. The small table is 18 inches in diameter that makes it look smaller. It is widely used for small dogs for improved results. This grooming table can be placed on all sort of places . This table means that you don’t have to stoop over work on dogs. This product comes with non slip top surface which keeps pets safe while your grooming. It comes with 3 colors black blue or pink. And also it’s easily rotatable table. Like humans, even pets requires to have vitamins. 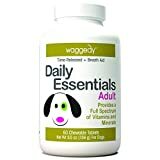 So institute of pet nutrition has introduced a best product to give necessary vitamins for your dog. Its chewable multivitamin products. It optimises GI tract and provide necessary bacteria for proper digestion. This nutritious one’s filled with natural enzymes helps the pet to completely absorb nutrients from it. It helps in reducing bad breathe, diarrhoea, and yeast infections too. 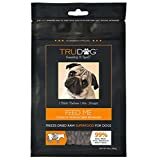 These are tasty chews which can be given to dogs and puppies over 6 months. Prairie dog products are very much of a high quality. This product is filled with Texas sausages. It contains beef and sweet potato in healthy delicious sausages is slow smoked. All the products given are 100% quality proven. It doesn’t contains any fillers, wheat, corn. This product dont contain any added flavours or colors and also no added sugar also. The product is proudly raised, grown and produced in America. This product to is much needed thing to be noted. 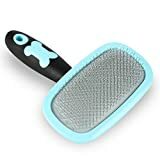 Dog/Cat brush is needed stuff for a pet owner. This is well designed brush which is made of rubber. It’s is easy to clean pets hair. This also gives added advantage and it makes massage for your pets easy. By giving regular massaging can help pets from getting skin diseases as its regulates blood circulation. The brush is made strong and reliably. It’s is durable in nature and also its gives a warranty of 90days. 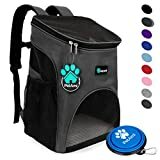 Premium pet carrier which is used for small cats and dogs. It’s is perfect on to go backpack for your pets. This product is structured well enough which gives the pets the needed comfortability while traveling. This also provides safety and convenience also. It comes with soft sherpa bedding to relax on. And it also provide comfortability to owner also by providing waist and chest buckle for extra support. Safety buckle is to provide safety for its pet. It also comes with side pocket, which helps to carry essential items such as collapse able bowls etc. This is an very good product, which comes with a bed warmer. The pet usually feel hard enough to sleep, so this product can be a solution. 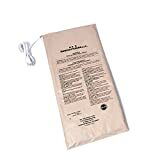 This bed warmer can be used to any indoor beds. They should be kept easily in any bed, and is very easy to use, as it’s just to plug them in. As this is easy to use and gives much big benefit as it provides very good nap to pet. This is perfect for potty training, this product makes it easy for puppy to win at potty training. 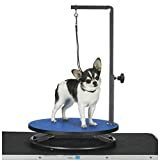 This pet pads offers a very good quality performance as well as provide well balanced convenience too, so that adorable Fido learns it fast. In addition to this, not only training the young ones, it’s also helps for sick and aged dogs to be more comfortable during traveling and when there are deprived of outdoor access. This pet food is food dogs. This food is specially made to take care the pet’s dental health. The food is beef flavoured. 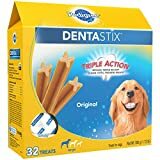 This special product is good for its dental health as the food is made in chewy texture and it helps in cleaning between teeth down to the gumline. The food is clinically proven to reduce the plague and tartar buildup. X shaped chews gives better breathe in the pets and improves its oral hygiene.